The F-2000 features an easily visible eight-digit LCD read-out with up to four decimal positions. The meter is field programable via the front panel touch pad, and the panel is equipped with a security lockout. 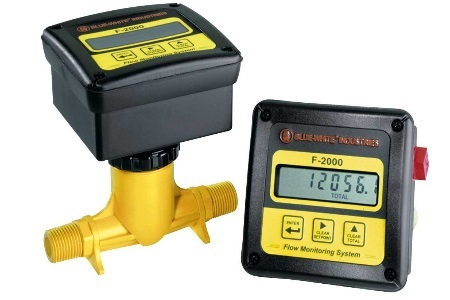 The F-2000 digital flowmeter is designed to accommodate pipe or wall mount installations, and it can be installed quickly and efficiently. The insertion-style F-2000 displays flow rate, total flow, and includes an NPN open collector output for communication with data loggers, SCADA systems, and other external devices. Additional features include: 4-20 mA / 0-10 VDC, batch processing, a high/low flow rate alarm output, front panel security lockout, and F-2000 comes factory programmed with a calibration certificate. For more information, visit www.blue-white.com.